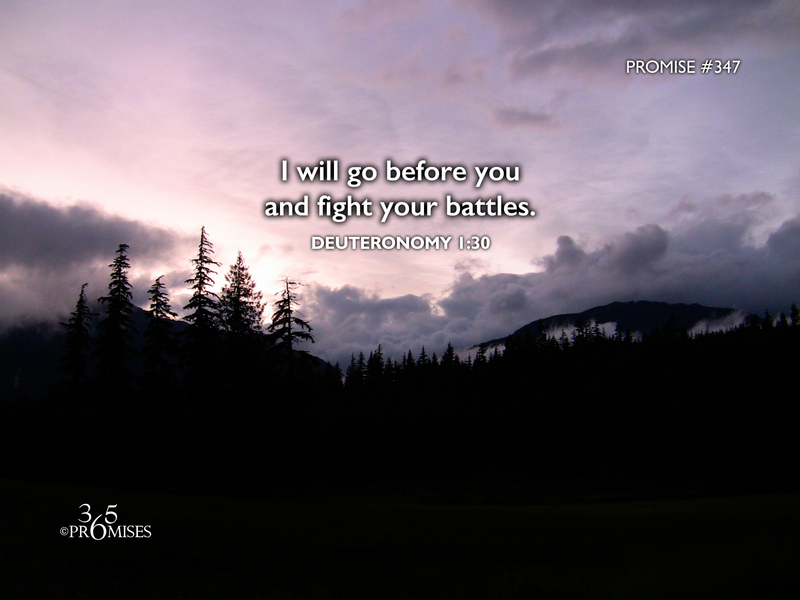 In Exodus 14:14, the Lord makes this promise to Israel... "The LORD will fight for you; you need only to be still.” (NIV) Today's promise is yet another reminder that God has committed Himself to fight for you. In Romans 8:31 Paul reminds us that if God is for us, who can be against us? We know from Ephesians 6 that our struggle is not with flesh and blood but with the dark powers and rulers of this world. In Ephesians 6:10 we are called to be strong in the Lord and His mighty power and to take on the full armor of God. It is His armor, not ours. If you are feeling overwhelmed today with the things that are opposing you, may this promise bring great comfort to your heart. My prayer is that each and every one of us would live in the safety and security that is described in Psalm 91, knowing that we live in the secret place of the Most High, and we dwell under the shadow of the Almighty. The amazing truth of the gospel is that God is for you, not against you and He will go before you and fight your battles on your behalf.